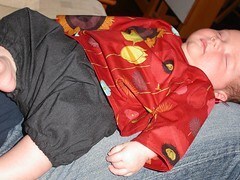 Here’s our little lady in the special outfit handmade for her by Al. It really is very beautiful! It’s the 6 month size and it fits her at only 6 weeks…….have I made an Amazonian baby or is the Japanese sizing really out of whack? Thanks Al, you are too kind. BTW, she is on the 91st centile for her length/age! We have received so many other beautiful handmade gifts which I do promise to share with you but just haven’t got around to taking photos….soz. Amongst them are quilts, another birth sampler and the most incredible lace shawl made by my amazing mother. More anon. I promise.